The question of genre suddenly seems somewhat vexed in Mexico. Should we call these narratives science fiction? Speculative fiction? Fantastic literature? Literature of the imagination? The debate over how to categorize and meaningfully refer to non-mimetic literature appears to be currently undergoing some significant and interesting turns, revealing at a minimum that there is no broad consensus as to what to call this kind of literary production, especially from the writers who create it. Alberto Chimal's recent essay here at LALT interrogated the history and usage of the term "speculative fiction" in order to make the case that this label comes from the Global North and attempts to apply a terminology (and ideology) over top a Latin American creative expression to which it does not correspond. Instead, he argues for "Literature of the Imagination" as an apt descriptor that adequately captures and describes what they write. Similarly, but less radical, Pepe Rojo said during WorldCon76 that Mexican Science Fiction should more accurately be called "Science Fiction from Mexico" because the expression there is no one single "Mexican" kind of the genre, but instead a nearly infinite variety within the country. And if we consider that in Latin America more broadly, Chilean author Marcelo Novelo states in another recent LALT essay that theoreticians like Spaniard David Roas, Peruvian Harry Belevan and Argentine Ana María Barrenechea feel there needs to be new terminology for non-realist literature that do not originate from elsewhere, especially in the new millennium. In short, a dialogue over genre –with the potential to turn into a debate– already seems to be underway. The label most used in academia to describe non-mimetic cultural production is "fantastic literature" (and not to be conflated solely with “fantasy,” i.e. JR Tolkien’s The Lord of the Rings or the Harry Potter series) which encompasses any and all narratives that express some degree of unreality. These include science fiction (and its many subgenre variants like cyberpunk and steampunk, etc. ), fantasy, gothic fiction, horror, magical realism/the marvelous real, ghost tales, fairy tales, folk tales, myths, etc. The reason this term endures is likely due to the fact that it casts the widest signification net possible, but it is so wide that it refers to too many non-realist genres at once. Hence, terms like science fiction and speculative fiction try to demarcate this production more narrowly within the broader scope of fantastic literature. However, just as scholars and literary outlets (this one being no exception) will likely continue to refer this kind of cultural production in some way as “speculative”, writers from Mexico will call it what they wish. Consider the bilingual anthology that was compiled, translated and published exclusively for The Mexicanx Initiative. The English title reads A Larger Reality: Speculative Fiction from the Bicultural Margins whereas the Spanish one is slightly altered as Una realidad más amplia: Historias desde la la periferia bicultural (A Larger Reality: Stories from the Bicultural Periphery). Or, paying close attention to the comic "Rhizome," one finds that in the English version the term "speculative fiction" gets translated as "literatura de la imaginación" (“literature of the imagination”). These slight differences reveal a subtle defiance to enduring, standard categorical terminology from elsewhere. To this end, the stories chosen for this dossier are not “pure” science fiction (meaning they contain some kind of technological or scientific speculation that underpins the transformation of narrative setting). Many stretch beyond this limit, often speculating without any techno-scientific extrapolation, or they may have this element but also hybridize with elements from other genres. For this reason, speculative fiction emphasizes the speculative without the science, and seems wider than the limits of science fiction but more narrow than fantastic literature. Consider Julia Ríos's "A Truth Universally Recognized," which switches identities and realities according to the interior, emotional pressures and whims of the protagonist, revealing a vivid portrait of a fluid, gendered subjectivity in the face of social and romantic anxiety. Or Libia Brenda's story-turned-comic "Rhizome" (art by Richard Zela), which imagines time travel to be possible through language but lacks reference to any speculative technological or scientific mechanism that makes this possible. Iliana Vargas's "Kan/Thrac" contains a bizarre setting and elusive main character that appears to be caught in a claustrophobic space and time, abounding in ambiguity and an atmosphere in the realm of the weird. David Ríos's post-apocalyptic "Aztlán Liberated" would by definition be science fiction if it were not for the inclusion of chupacabras, the mythological borderland monster. In a surprising turn, this story also empowers the traditionally denigrated figure of the cholo. Finally, Pepe Rojo's very short story "Shoot" continues his obsession with media and the limits of the visual frame; here, he aligns the focalization of the narrator and the limits of his or her field of vision to in what appears to be a first person shooter video game about killing zombies or an actual zombie apocalypse. The reader is left to decide. “The book is the result of a tour de force: between April 1st and August 13th we managed to put together a volume of around 200 pages with 12 short stories and a comic (adapted from another story). First, I wrote to someone in The Mexicanx Initiative; later, I sent communications via messenger that felt like sending message in bottles to the sea that said, more or less, “Hello. We do not know each other, but I am compiling an anthology to take to WorldCon. Would you like to participate?” The incredible part was that many people said yes, and many offered to help. I cannot expound on this part in more detail, but that help was key in realizing the project. As the time neared to send the manuscript to press, Julia Ríos spoke with her colleagues at Fireside Magazine (because they were going to pay for the printing with money from my account and several others) and said that they could do a Kickstarter campaign (for crowdfunding from the public) in order to collect the money. The campaign lasted 11 days; first we asked for $1,500 in order to cover printing costs, but we reached that amount in 24 hours. Next we raised the goal to $7,500 in order to pay the people that collaborated in the anthology (according to standard and current rates of the SFWA – Science Fiction Writers Association): writers, translators, and art. John Picacio, the generous soul that he is, donated the cover image and refused to accept any payment whatsoever. But in the last second, and I mean literally the final second of the campagin, a backer covered the $1,400 deficit, and as such we reached the $7,500 goal. I followed the process during the days of the campaign feeling like those that bet on horses at the races: my heart sped up every time I saw the counter and it got closer to the goal. Stephen C. Tobin is an Assistant Adjunct Professor at UCLA whose research focuses on Mexican fantastic and science fiction cultural production. He is currently working on the manuscript to his first book, Specular Fictions: Vision, Technology and Subjectivity from Mexican Science Fiction 1993-2008, which argues that science fiction literature has become a unique discursive space through which authors reflect upon and critique contemporary specular regimes within Mexico. His upcoming article titled "Does the posthuman actually exist in Mexico? A critique of the essayistic production on the posthuman written by Mexicans (2001-2007)" will be included in the forthcoming anthology Posthumanizing the World: Speculative Aesthetics in Latin(x) American Science Fiction, from Palgrave's Global Science Fiction Series. His article "Televisual Subjectivities from Pepe Rojo's Speculative Fiction: 1996-2003" was recently published at the University of South Florida’s Alambique: Revista académica de ciencia ficción y fantasía. He also has published piece in Tapuya: Latin American Science, Technology and Society, alter/nativas, and Meister, the Spanish and Portuguese Department at UCLA's literary journal. Likewise, he teaches courses on science fiction and posthumanism at UCLA, such as the survey course Spanish-American Science Fiction and Posthumanism from the Periphery: Robots, Cyborgs and Clones in Latin American Culture, which encourages students to critically consider these enduring icons that have appeared throughout the years in the region. In addition, Stephen’s courses host as frequently as possible science fiction authors, such as Pepe Rojo (Mexico) and Yoss (Cuba), which give students unmediated access to the creator of works under discussion. The eighth issue of Latin American Literature pays homage to Nicaraguan writer and politician Sergio Ramírez, winner of the 2017 Cervantes Prize and an important voice in a country currently gripped by crisis. 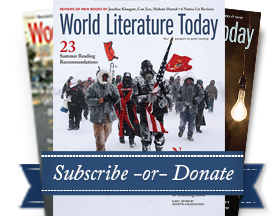 We also feature poetry from Octavio Armand, as well as special sections dedicated to four indigenous writers of Mexico and Guatemala, bilingual sci-fi from Worldcon 76, and the poetry of Marosa di Giorgio, Olga Orozco, and Elena Garro.